An 8-year assessment of the air quality at one of the largest military bases in Afghanistan reveals that servicemembers' and civilians' exposure to air contaminants from the "burn pits," used for disposing of trash, could pose long-term respiratory problems, according to an Army memo. "The long term health risk associated with air conditions on BAF ... indicates there is a potential that long-term exposure at these levels may increase the risk for developing chronic health conditions such as reduced lung function or exacerbated chronic bronchitis, chronic obstructive pulmonary disease (COPD), asthma, atherosclerosis, or other cardiopulmonary diseases," reads a portion of the one-page memo, dated April 15, 2011, obtained by Danger Room and posted to its website. 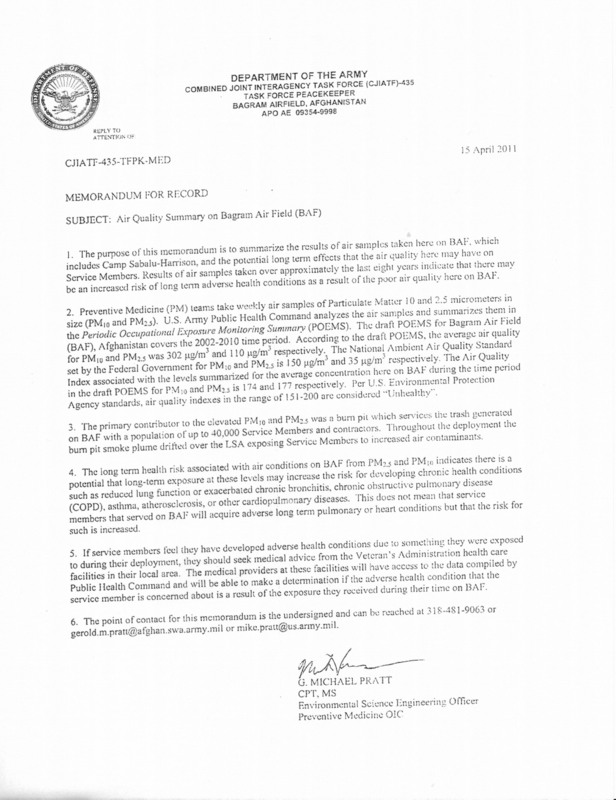 Preventative medicine teams took weekly air samples at Bagram Air Field, just north of Kabul, beginning in 2002, and measurements for contaminants exceeded healthy standards set by the U.S. Environmental Protection Agency, the posted memo states. Findings and the memo's summary contradict years of government assertions that there was no direct scientific link between poor health issues and exposure to smoke from burn pits, according to Danger Room's report on burn pits in Afghanistan. In October 2001, researchers studying troops’ respiratory problems released findings that suggested poor air quality in Iraq and Afghanistan might pose a bigger threat to servicemembers’ long-term health than exposure to toxic smoke from burn pits. But they caution that their work still leaves many questions unanswered. Last year, some members of Congress introduced a bill to create a registy of patients and illnesses believed to be connected to the toxic smoke.